Our supermarket was very proud to offer broccoli for $1.99 a head last week. Or, I can buy it frozen for around a dollar. If you grow broccoli yourself from seed, the packet will cost you $2.25 from Baker Creek Heirloom Seeds and you will receive 300 seeds in the packet. Even if only half of the seeds grow to bearing size, you are way ahead of the supermarket. Speaking of Baker Creek Heirloom Seeds, in my opinion they have the most mouth-watering catalog on the market. The photographs are scrumptious. For beautiful and extremely helpful seed packets, Renee’s Garden Seeds cannot be beat. Her seed packets are like watercolor paintings. They are beautiful enough to frame and hang on the wall. Seeds and information are all contained in these works of art. All of her seeds are $2.79 per packet and come with extensive planting directions as well as when to plant in your part of the country, and even what to expect when your seeds mature. Renee is an on-line seller only with no paper catalog. Some old-time U.S. seed companies have been around for generations. Park Seed is one. They sponsor a Flower Day every spring. Hordes of people flock to little Greenwood, South Carolina to relax and wander the flower and vegetable trial gardens or tour the seed facilities. Park carries many of the up-to-date varieties of vegetables, like the AAS (All America Selection) past winners Eggplant Hansel and Eggplant Gretel. These two are perfect for container gardening. You can also find a huge selection of herb seeds in their catalog. They are the originators of the Whopper series of vegetables. Park’s Whopper tomato is a yearly guest in my garden. Another old-timer is Burpee. Burpee also has many up-to-the-minute veggies and flowers. They introduced the Big Boy and Better Boy tomatoes years ago. Both of these are staples in many Southern gardens. Better Boy is always at home in my vegetable patch. This year I’m adding a new seedless tomato they have listed called, obviously enough, Sweet Seedless Hybrid. At $5.25 for 10 seeds, it is a bit pricey. But, I have to try it. If you are looking for heirloom tomato, pepper, and eggplant seeds then Tomato Growers Supply Company is another catalog for you. In its pages, you will find some of the most unusual vegetables available from all over the world. 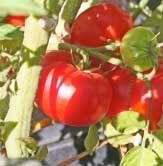 If you want to grow the most delicious but quick to spoil tomatoes, look at the black selections. These aren’t for a small garden just because they take longer to mature and do not set as much fruit as the newer varieties. The flavor, though, is something you will never get in a supermarket. My biggest problem with this catalog is cutting down on the number of varieties I fall in love with and plan to order. This year I’ve narrowed it down to Goliath, Kosovo, Mexico, Giant Belgium, and Black from Tula. I’m throwing in a Chinese Giant Pepper, too. I’ve ordered from all of the above seed companies over the years. In fact, Renee often shares seeds at Garden Writer Association meetings. If you want to grow organic produce, you should purchase Certified Organic Seed. Seeds of Change offers 100% certified organic seed. Their catalog has a very handy chart with planting rates and distances for an abundance of vegetable crops. Territorial Seed Company has the largest paper catalog of the lot. They also have an expansive list of vegetable and herb plants they will ship. They offer a total guarantee on their products. First, Order early. Gardening is the number one hobby in the United States and vegetable gardening has surged with the sinking of the economy. Many seed companies sell out of favorite seeds early. Second, make sure you factor in the shipping costs at the different seed companies. Sometimes there can be a significant difference in shipping charges, which can add to your total invoice, so shop wisely and shop early.